In 4-quart saucepan, heat oil over medium heat. Cook fennel, onion and garlic in oil about 5 minutes, stirring occasionally, until crisp-tender. Stir in tomatoes, broth, salt and pepper, breaking up tomatoes with spoon. Heat to boiling. Reduce heat. Cover; simmer 20 to 25 minutes or until vegetables are soft. Carefully pour half of the mixture into blender. Cover; blend on high speed about 30 seconds or until smooth. Return to saucepan. Repeat with remaining mixture. Keep warm over low heat until serving. 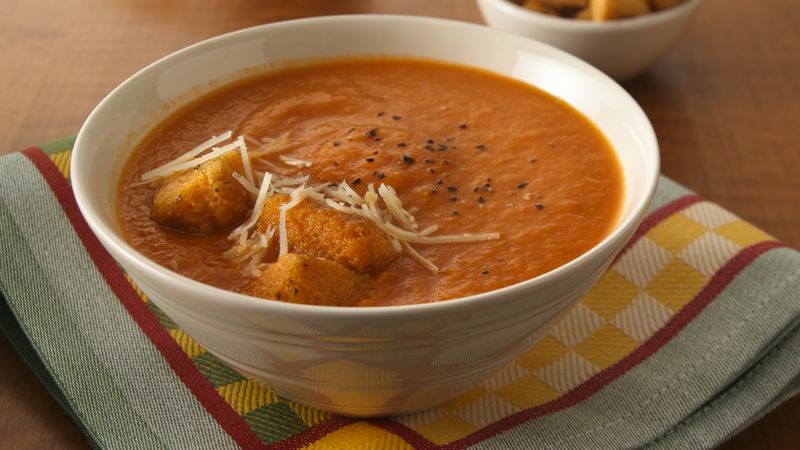 Serve this soup topped with a handful of herb-flavored croutons and a sprinkling of Parmesan cheese.